I've now made several seasonal variants of two ingreedient chocolate fudge all of which have proved to be very popolar. We had Last Rolo for Valentine's Day and Terry's Chocolate Orange & Zingy Orange Matchmaker and After Eight and Mint Matchmaker for Christmas. I wouldn't want Easter to feel left out so I've come up with both a white and a milk chocolate version. The White Chocolate Easter Fudge recipe was commissioned by Chapelton. This is Aberdeenshire's new town and whilsn't I don't live there I've already benefitted from its facilities, businesses an community. 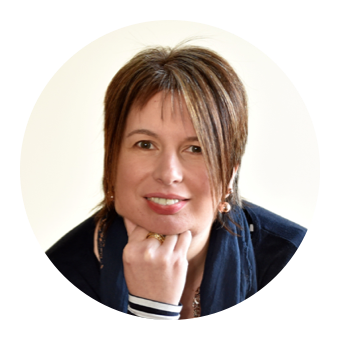 Whilst you're on the Chapelton website getting the fudge recipe be sure to check out the variety of properties available to siuit all incomes and needs. 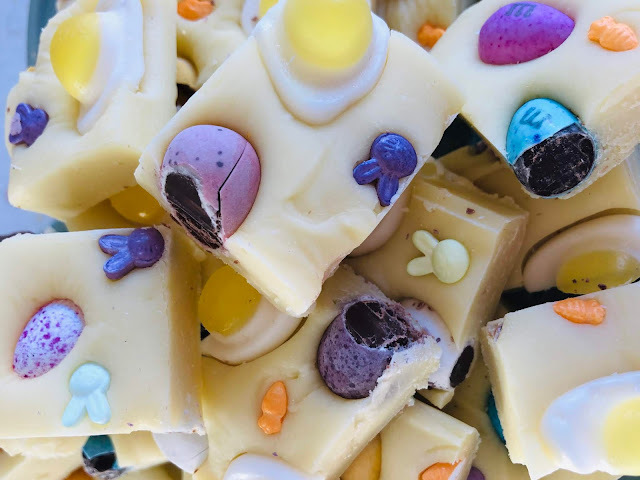 The Creme Egg Fudge needs only three ingreedients and along with it's recipe below I've shared other sweet easter treats that I've created over the years. I do hope that Lent hasn't been too painful and that the Easter Bunny will be good to you! Break up the chocolate and put in a microwavable bowl along with the condensed milk. Microwave in a series of 30 second bursts. Tip the fudge into the prepared tin and spread it with a palette knife into a smooth and even layer. 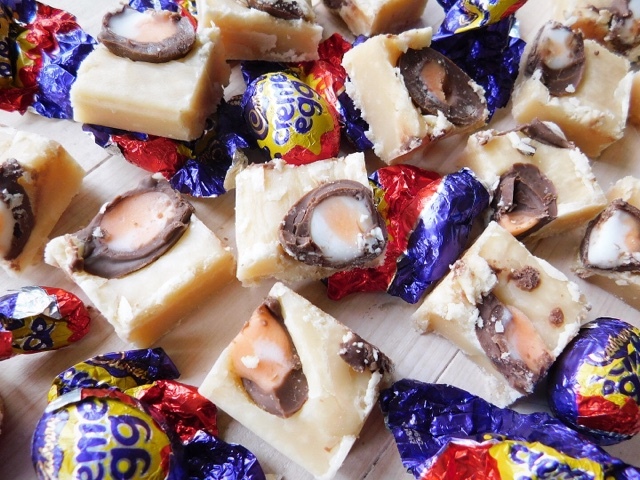 Push your halved Cadbury Mini Creme Eggs into the fudge. Place the tray of fudge in the fridge to set for at least four hours (or ideally overnight). 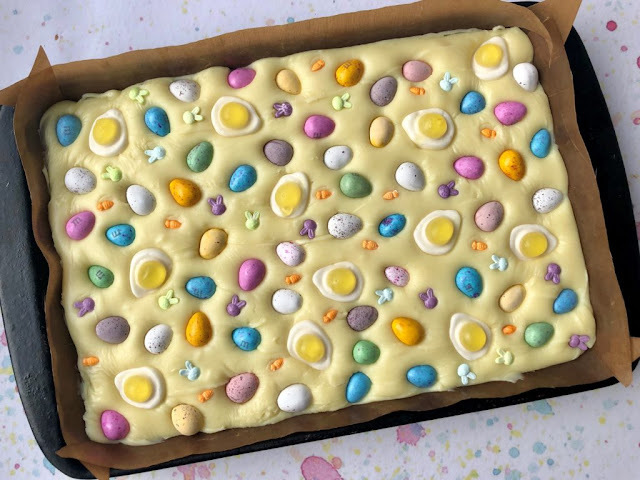 With only two ingredients, no tricky temperatures or boiling hot sugar required, this microwave Easter Fudge is quick and easy to make. Once you’ve mastered it you can adapt the toppings to suit the occasion and personal preference. You can make it with white, milk or dark chocolate. I use supermarket own brand which works just fine. More expensive chocolate may be even better, I just haven’t tried it! You can also make it in a bowl over boiling water if you don’t have a microwave. Malt Easter = Malteaser. Do you see what I did there? Combining a Malteaser Tray Bake with Mini (or micro eggs) takes it to a whole new level of crunchy deliciosness. Dentists look away now! 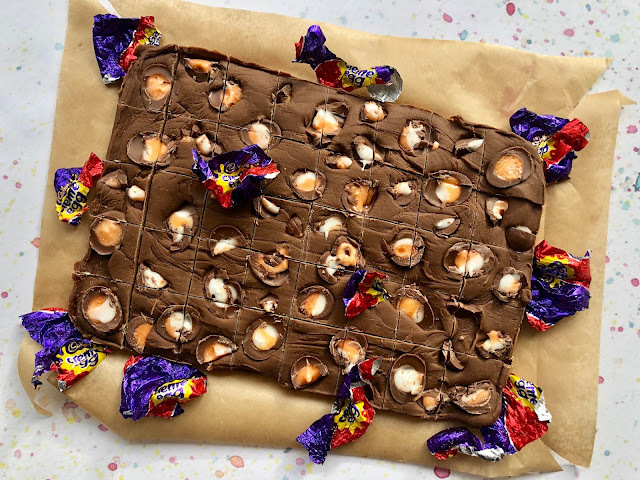 When the phonemonon of creme egg recipes combines with my own passion for Scottish recipes you get a seriously sweet Easter treat. 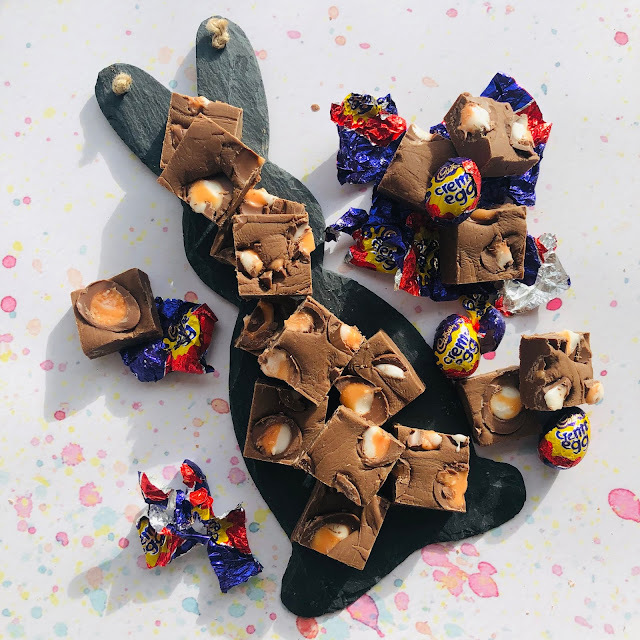 Mini Cadbury Creme Eggs are combined with traditional Scottish Tablet for a confection that is seriously naughty but nice. 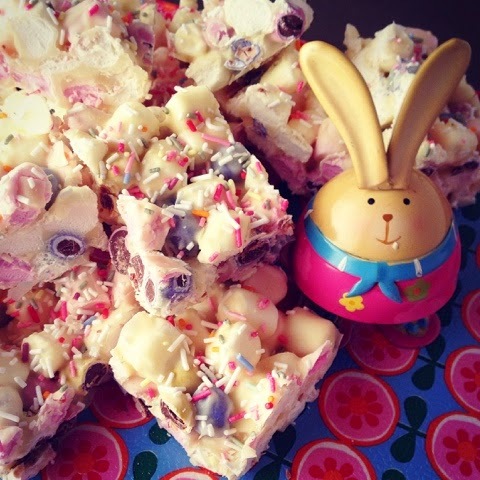 I've called this Easter Bark but it's probably more of a cross between Rocky Road and Bark as whilst it has marshmallows it doesn't have biscuits. 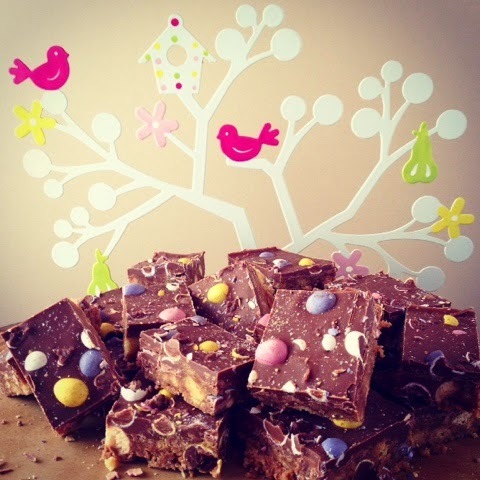 I initially devised it as a way to use up leftover Easter chocolate but it's equally delicious whether eaten before or after Easter. When Easter and Shrove Tuesday collide you get Scotch pancakes with the addition of Creme Egg slices. You'll either love them or hate them. The trick with these is to freeze the eggs first - the ends of the eggs are the chefs perks! 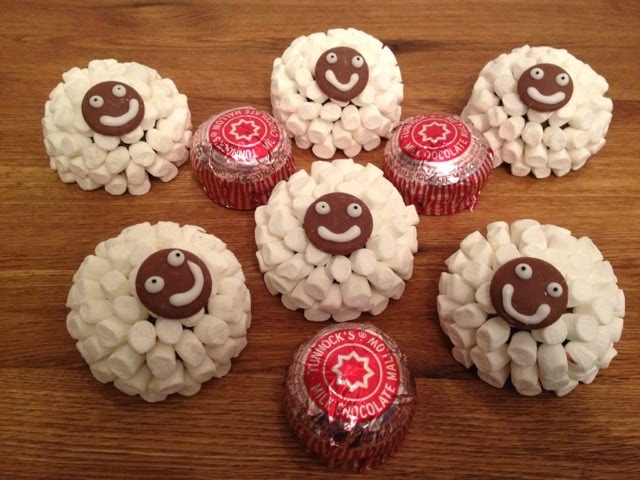 Another of my quirky Scottish recipes using the iconic Tunnock's Teacake. 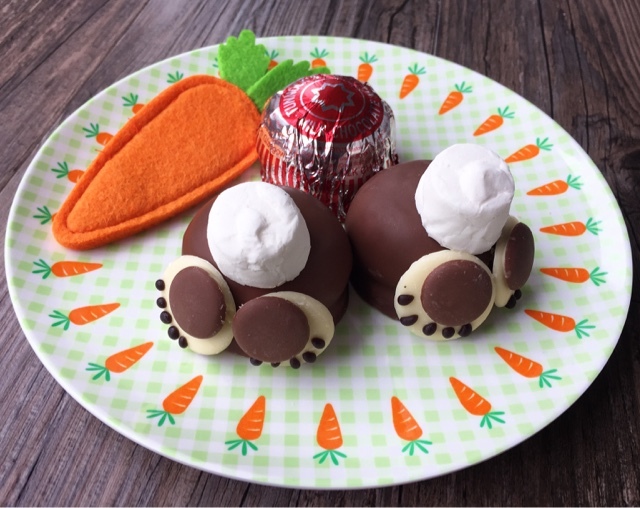 A quick and easy assembly job using Tunnock's Teacake along with chocolate buttons and marshmallow tails to make oh so cute Easter Bunny Bums. These started off as sheep for Aberdeen Football Club but there's no reason that they can't be repurposed as marshmallow Easter lambs. 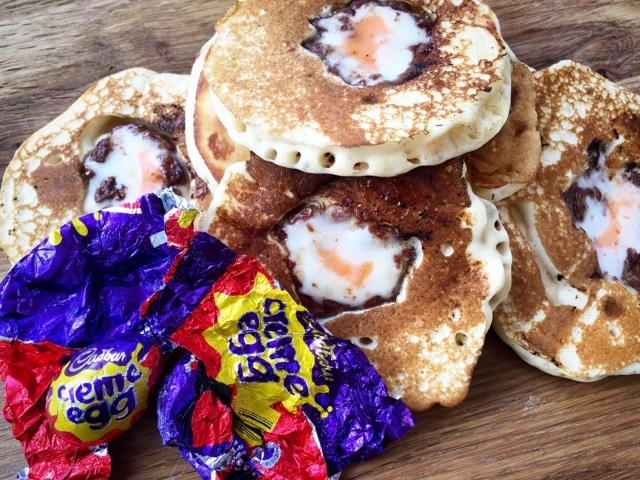 Creme Egg pancakes sound like an absolute winner!